According to a study released last March, an uncomfortable trend is rising in the elder community. Many adult children are noticing an uptick in their parents drug use and are uncomfortable addressing the issue. When a child has to parent a parent, there is no easy way to address the concerning issue. Baby boomers drug overdoses increased 11 fold between 1990 and 2010, according to data from the Centers for Disease Control and prevention in 2015. 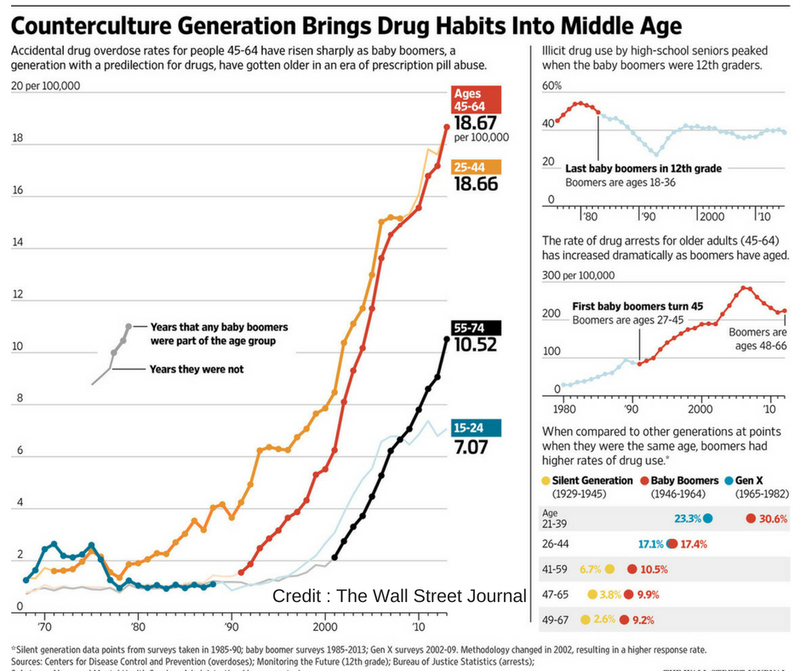 Baby Boomers address adults born between 1946 and 1964, who during their youths were known to have the highest drug use rates of any generation. Before, while in their younger years, ‘Boomers’ were inclined to use mind-altering drugs, psychedelics and cocaine were a widely accepted habit that was no secret between the 70’s and 80’s. Now it’s painkillers prescribed to them to relive aching bones and other ailments. Most popularly in the boomer age range, pain pill use is most common, followed by marijuana use and then anti-anxiety meds use according to federal Substance Abuse and Mental Health Services Administration. The number of opioid related overdoses in the 45-64 age group has shown to be the most impacted by the opioid crisis. The most commonly concerned age group impacted by drug use had always been teenagers, but for nearly 15 years, every age group but the baby boomers has seen a decrease in drug use. The high number of overdose deaths only speak for a percentage of those who used opiates but no longer have a chance at recovery. The remaining users struggling with addiction will also have a hard time finding treatment, as most drug rehabilitation programs are still trying to grapple with the growing number of older patients. According to researchers, nearly 5.7 million people over the age of 50 will need substance abuse treatment by the year 2020. Treating older addicts require an honest approach, allowing them to have an active roll in their own treatment, educating them on normal behaviors and drug reactions. Treatment centers who took federal funding were able to collect some data about their admissions and in 2012, 36% of the patients aged 45-64 were being treated for heroin abuse, 10% for methamphetamines, 22% for crack cocaine dependence, and 12% for opioid abuse. Alcohol or alcohol mixed with another drug made uo fro over half of all admissions. Drug rehab for an older generation requires revamping treatment centers, ridding them of bunk beds, providing on site medical care and hiring more experienced and also older, addiction counselors. The families of aging users sometime don’t even know how to address the issue, nearly 22% of family members don’t address their parents drug use in fear of angering them. Others are unsure of the signs, and may misdiagnose their shakey hands or forgetfulness as just normal symptoms of aging. Sometimes not all family members can agree on the best way to treat the situation. Some members may say leave them be as long as their not driving, they’re in their “golden” years, and the other half of the family may want to ensure as long of a life as possible for their loved one. Mixed feelings towards addiction in aging family members is one of the number one reasons why users never get the help they need, due to their families’ incongruences. A solid and supportive front is necessary in order for those in their later years to get the help they need.